It’s been 40 years since Congress signed the legislation, Title IX (nine, for those of you that are Roman Numeral challenged), which broke the gender barrier in sports. In fact, according to www.titlenine.com, in 1972 there were 30,000 girls participating in high school sports, and today there are over 3,000,000. Those numbers were nowhere more evident in this year’s recent Olympic games. 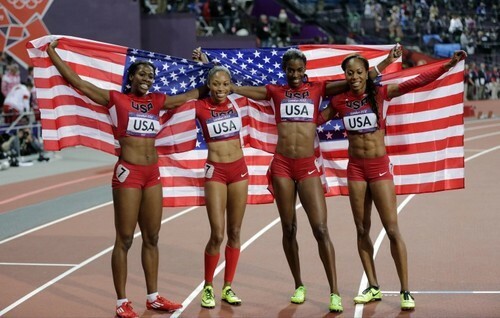 The U.S. Women athletes won over half of the total medals, and 66% of gold medals. Without the contribution of these fierce young ladies, our country might not have garnered the most medals at the games. However, while there are significantly more girls and women participating in sports, all things are not equal. Besides the WNBA, there are no other professional sports leagues for women. And even with the WNBA, there have been challenges filling seats at the games. Additionally, women are not paid equally in other sport’s jobs. Which is all very interesting when you consider how high ratings were for the Olympics, especially for women’s events. Women’s gymnastics, volleyball, basketball and soccer were must see events during. Not to mention women’s tennis and swimming. There’s an interest in watching talented female athlete’s excel, therefore hope does exist for spectators of women’s sporting events. At one point, women athletes were happy just to have their own uniforms, but those days are long gone. Women will continue to fight for equality in sports as they do in other areas. But, as we ladies continue on this journey of equality in life and sports, let’s bask in the glow of the U.S. women’s athletes’ performance at the 2012 games! When you think of Mike Tyson, I’m guessing the word “thespian” doesn’t come to mind. But that is exactly the new title he will be adding to his resume. Inspired by the play, “A Bronx Tale”, Mike will be making his Broadway debut with his one-man show “Mike Tyson: The Undisputed Truth”. And with his recent cameos in The Hangover movies, it’s easy to assume this play is based in comedy, yet it is far from that. Iron Mike will be sharing the most personal of stories, baring his emotions to the world, and you have to respect him for it. It’s always so easy to brush off athletes for being more brawn than brain, for being more physically gifted than academically gifted. And Mike Tyson has been ridiculed for that and more throughout his impressive boxing career. But, in just watching his interview on the “Today Show”, I became both impressed with his honesty and intrigued by the show itself. With Spike Lee (director of his show) by his side, Mike talked of his volatile past and what finally made him choose to live a healthier lifestyle. He comes off as a man that is both humble and genuine in discussing the life he has led. He’s also brutally honest, a little too honest for morning TV as he was often steered in another direction during the interview. It’s his honesty in that interview that perfectly sets up the premise for his show. A one-man show, where Mike Tyson will divulge his darkest secrets in front of a live audience, how is that NOT something you want to see? No topic is off limits, as Tyson will discuss being in prison, drugs, prostitutes, and the rest of the debauchery in which he has engaged. The show debuts on July 31, if you can, check it out.